Learn The Facts About Carpet Fibers, Carpet Specifications and Carpet Durability. This is the Practical information homeowners need to make wise and informed Carpet buying choices. What Carpet Fiber is Best for Kids and Pets? Which Carpet Fibers to Avoid and Why. How to Select the Right Carpet Fiber for Your Home. The type of Carpet Fiber you select will determine how long your new carpet lasts, how soft it feels, what colors are available, how easily it cleans and how much it costs. This is one of the most critical factors when choosing and comparing new carpet. You must compare apples to apples. For example, you cannot compare a NYLON carpet to a POLYESTER carpet, or a WOOL carpet to an OLEFIN carpet. This would be like comparing apples to oranges. You have to compare similar carpets and narrow it down to the one that best meets your needs and lifestyle as well as meeting your budget. All fibers can be modified in many ways to make them look or feel different. Some fibers are “bulked up” to make them look and feel thicker. Some fiber strands are made thinner so they feel softer. These changes are common in the fiber industry and have been so for decades. This is nothing new. Still, the main characteristics of the fiber hold true. For example, a polyester fiber is not very resilient. This means it will mat down easily in moderate to heavy foot traffic areas in your home. This is especially true in hallways and on stairs. Nylon is the most durable and the most resilient fiber and does not mat down so easily. It is the best choice for moderate to heavy foot-traffic applications. There are several other fiber to choose from, but all have their good and bad qualities. Carpet makers are constantly trying to convince consumers that there is a new and improved carpet fiber that is worth buying. This is where I have to warn you, don't believe everything yo hear about a newfangled carpet fiber or manufacturing process that makes an old fiber better than it was in years past. These altered fibers are often marketed under fancy new names. They are still the same fiber as before with the same limitations they have always had. The superficial changes do not allow them to perform much or any better than before, but the fiber manufacturers surely want you believe so. In fact, making the strand thinner may make the fiber feel softer, but it may also make the fiber less resilient and less durable. However the price you pay will certainly be higher! Nylon is a generic name or designation for a family of synthetic polymers first produced in 1935 by the DuPont Company. As far as fibers go, Nylon is the most durable and the most resilient of all carpet fibers. A resilient fiber is defined as having the ability to return to its original form or position after being bent, compressed, or stretched. Nylon is the most resilient fiber used to make carpet. This is what keeps a nylon carpet looking like new longer than any other fiber. Nylon is one of the more expensive fibers second only to wool. I would consider choosing a Nylon carpet if you have a lot of foot traffic and longevity was my biggest concern. Nylon is a synthetic fiber that outperforms all other fibers. It wears exceptionally well, is very resilient, resists abrasion, resists stains and is easy to clean. Carpets made of nylon tend to look like-new longer than any other fiber. Nylon comes in virtually all styles and colors. What more can you ask for? Nylon is the best wearing, most durable fiber available. There are two types of nylon fiber, one is referred to as Type 6 and is made by Anso® and the other is Type 6,6 also known as Stainmaster®, made by Antron®. Personally I prefer the Stainmaster 6,6 Nylon and think it is a better fiber, but how much better? Not so much that I would pay a lot more to get it, however if all specifications and price were about equal then I would certainly opt for Stainmaster. Stainmaster is more well known because of all the advertising they have generated since 1986. 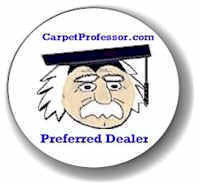 Take my free Carpet Foot-Traffic Test to help determine what grade of carpet you need for your home. "Q. Do Tactesse, Caress, Lisse' and other branded "Soft Nylons" hold up as well as a regular (non-soft) Nylon fiber?" This is an excellent question. From my experience, I have found that "soft nylon" fibers are not quite as resilient or durable as a standard (non-soft) denier nylon fiber. The higher the denier, the heavier the filament. The way they make a standard nylon fiber softer is to make the strand thinner. By doing so, I believe that some of the resiliency is lost. This thinner strand creates a carpet that is softer to the touch but may be more susceptible to matting and crushing. Don't take this the wrong way, I'm not steering you away from buying a soft nylon, but if you want to have the absolute most durable and most resilient nylon for the money, I suggest you buy a carpet made with a standard denier nylon fiber. What is Fiber Denier? Denier is the measurement of strand diameter. Fiber denier is easiest understood for those who gone fishing and used a nylon filament fishing line. The thicker the line is, the stronger it is. When fishing for Trout most fishermen use a thin 4-pound test line. For bigger fish like Steelhead or Salmon, a thicker 8 or 10-pound nylon test line may be selected. Denier is the measurement of the diameter of the extruded fiber strand. Some carpet fibers are purposely manufactured thinner to make a carpet that feels softer to the touch, but in doing so some of the strength, durability or resiliency may be sacrificed. Therefore I believe a carpet made with a standard (heavier) Denier Nylon fiber will be more durable and more resilient than a carpet made from a thinner strand as is commonly used in today's branded "Soft Nylons". What does "branded" mean? A branded product is one made by a well-advertised or well-known maker with label or name attached to it. When it comes to carpet, a specific type of product can be branded and advertised and marketed to attract consumers. Soft nylon styles have been branded under certain names and advertised to market the product to consumers who are interested in having a carpet with soft qualities similar to those made from a carpet made from wool, but not as costly. The cost of "branded" products are more costly because of their characteristics and marketing. If you want a carpet that is durable, soft and resist stains, Sorona® may be the fiber you are looking for. Sorona has permanent stain resistance that is engineered into the fiber and will never wear or wash off. But remember, no carpet is completely stain proof. Sorona, also known as Triexta or PTT was developed by DuPont™. It is a polymer derived from corn. It is said to have the best anti-stain properties and cleans easier than any other fiber. They also say it is very durable. Sorona™ is clearly more durable than PET or Polyester, but is it as durable as Nylon? I do believe that Sorona resists stains and cleans easier than Nylon, but the durability and resiliency of Nylon is hard to beat. Either way, Sorona may be the fiber you need for your home and stain resistance is your main concern. Bear in mind, I would not suggest this fiber for those with heavy foot- traffic applications, especially if you expect your new carpet to last more than 10 years. Sorona™ to be manufactured at a comparable cost to Nylon. Mohawk™ has a line of carpet styles using the Sorona fiber and they have branded it and call it Smartstrand®TM. Q. Sorona has been around for many years now, do you think it is as good a fiber as they claim it is? Knowing what grade of carpet to buy is the key and many folks end up buying a carpet that is incapable of tolerating their level of foot traffic. This always ends in frustration and makes for an unhappy customer. 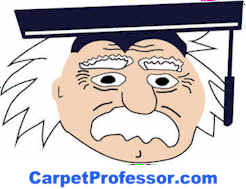 That's why I created a free and simple Carpet Foot Traffic Test so folks would have some idea about where they stand and what grade of carpet to consider buying. This is my take so far and I still firmly believe that Nylon is more durable and has better resiliency than Sorona, but Sorona does seem to resist stains a little better than a nylon to some degree, how much is debatable. Thanks for your question I will post this information (and date it) so everyone can be updated on this subject. Most of the information about Sorona (on the internet) is written by the manufacturer or the authorized Sorona dealers. You just don't get the whole story from those sources. Polyester is one of the least expensive synthetic fibers to manufacture. A thick polyester carpet may feel nice and soft, but it is not a resilient fiber, and it does not a make a long-lasting carpet. Polyester carpets mat down in a hurry, and that has always been the problem with carpets made from this fiber. When you walk on a carpet, with every footstep you bend and compress the fibers and soon they begin to fall over. Once polyester fibers are crushed, they won't spring back to their original position. This is why warranties for polyester carpets do not cover claims against matting or crushing. Don’t be fooled by salespeople who recommend carpets made with polyester. It may be acceptable to buy a carpet made with polyester as long as you know what to expect and don’t pay a lot of money for it. I wouldn't expect to get a life span of more than 5 years on a polyester carpet, regardless of its tuft twist, density rating or warranty claims. I might consider choosing a carpet made of polyester if I wanted to spend as little as possible on a carpet that looks nice for a very short amount of time. How much does carpet cost? Some carpets are made with a blend of Polyester and Nylon. Usually a small amount of nylon is added to the mix. They do this to try to make a polyester carpet a little bit more resilient and durable. While this may have a benefit in some situations, I personally do not believe it makes a worthwhile or more valuable product. It's like putting a Mercedes hood ornament on a Ford Fiesta. It doesn't make much sense to me. But carpet makers have long tried to come up with a way to make Polyester more durable because it is so cheap to make. Olefin is a very strong synthetic fiber. It is often used to make Berber carpets, commercial carpets and outdoor grass carpets. Olefin wears well and has good stain resistance when anti-stain treatment is applied. Olefin also has good anti-static properties. However, Olefin is not easy to keep clean and tends to look dingy when soiled. It has poor resiliency so smaller looped Berber styles wear better than do larger looped styles. Read My Article: Lifestyle Often Dictates Best Carpet Choice for those with kids or pets. Wool is a natural fiber and should not be compared to a synthetic fiber. Some carpets are offered with a blend of nylon and wool in varying amounts. Usually I see 20% nylon and 80% wool. This gives wool some of the characteristics of nylon like increased resiliency and durability as well as lower cost. This can be a very good blend to consider having. Wool carpets are considered the most elite of fibers and are the most expensive of all carpet fibers. Wool is a natural fiber and is very soft. It has excellent insulating qualities and is naturally fire resistant. However, wool carpets must be professionally cleaned by specialized carpet cleaning methods and is more expensive to maintain and install than synthetic carpet styles. Comparing wool carpets based on price and quality can be more difficult because well known brand names can increase the cost dramatically and the quality may be more difficult to determine. If you can afford wool carpets it would be an excellent choice for most people. However, children and pets can be very hard on any carpet so careful consideration should be taken if you have small children or pets prone to having accidents. I am confused about carpet specifications. I see these initials on the back of some carpet samples but not others? What does BCF mean? BCF stands for Bulked Continuous Filament. You might want to buy a carpet made from a Continuous Filament fiber if you hate vacuuming. Why do some carpets shed and fuzz? The word "Bulked" refers to a process where the manufacturer makes the strand of fiber beefed up, or bulked to create a fatter and more beefy feel. Think of it like using a volumizer on your hair. It makes it feel thicker and fuller. The "CF" means the strand is formed in one long strand. When they make carpet from a CF fiber is virtually eliminates the shedding and fuzzing that you experience with carpet made from a Staple Fiber. A "staple fiber" is short lengths of fiber strand, usually 3 to 10 inches long, that are spun (twisted) together to form a tuft. When carpet is made from a staple fiber, the carpet will shed and fuzz for up to a year after installation. Every time you vacuum, your vacuum bag will fill up quickly with carpet fuzz. This is to be expected, but if you select a carpet made from a continuous strand, (aka BCF) then you will not have the shedding or fuzzing issues that you encounter with a carpet made from a carpet made from staple fibers. What is a Continuous Filament Fiber? - Does it say BCF or CF OR CFN? If the Carpet Sample does not indicate that the fiber is made from a Bulked Continuous Filament strand (BCF), then you can assume that the carpet pile is made from staple fibers and therefore will shed and fuzz for a period of time after installation. The amount and duration of shedding and fuzzing is determined by the quality of the carpet and the length of the staple fibers used in construction. There is no way to know for sure how long a carpet will shed and fuzz in your home. Unless you like vacuuming three times a day, and filling up your vacuum bag with loose fuzz, then I suggest you buy a carpet made from a Continuous Filament fiber. Some Carpet Samples might use the abbreviation of CF, for Continuous Filament, or CFN for Continuous Filament Nylon. If a carpet sample is simply marked "100% Nylon" you should assume it is NOT a "Continuous Filament" fiber. It's getting harder everyday to find an honest and reputable Carpet Dealer! That's why I have been putting together my own special hand-picked list of Carpet Dealers who are locally owned, give free estimates, offer fair prices, have knowledgeable staff, provide honest measuring and hire qualified installers. See who I recommend near you! Dupont™ and Sorona® are a trademark and a registered trademark of E.I. DuPont de Nemours and Company.